Chelsea Palace is an online Nektan casino that is a new casino to the industry. Chelsea Palace casino was established in 2018. With it being such a fresh casino, Nektan have added some awesome casino features to encourage players to sign up and create a bigger customer base. Chelsea Palace is licensed and regulated under the United Kingdom Gambling Commission, meaning that it is a safe and fair casino for you to play at. In this review, we will take a look into the huge selection of games that the casino has to offer, as well as how user-friendly the website is. Aesthetically, the Chelsea Palace casino website is nice, simple and pleasing. Nektan casinos can come in all different appearances. Some Nektan casinos can have themes to them, meaning that they are given a background and have characters or icons included in the background that make them relevant to that theme. Or you can get casinos like the Chelsea Palace casino, where it is a more simplistic looking casino but still looks pleasing on the eye. For this casino they have gone with a black and gold them, which gives it a prestigious look. At the top of the casino, we have the Chelsea Palace logo as well as the Chelsea Palace login options. Underneath this is a slideshow banner that showcases the latest promotions and exclusive games that may tempt customers into signing up for. Under this, there are a list of different category tabs, to locate casino games easily, these tabs include: Player Favourites, New Games, Jackpot, Live Dealer, Casino Games, Instant Win, All Games, and also a search bar to easily locate a specific game title. Underneath these titles of the thumbnails to some of the most popular casino games that you can simply click on and gain easy access to. As you make your way down to the bottom of the casino page, you can find a range of quick links, licensing certificates and also payment options for players to use. As it is a Nektan Casino, players can expect a range of different software providers included in the casino, bringing their best games to the casino and creating a fun filled experience for players to win some mega money. If you are an experienced punter, you will have come across some of these providers before, they include: Microgaming, Netent, Yggdrasil, Big Time Gaming, Evolution Gaming, Pragmatic Play, Elk Studios, Quickfire, Merkur, Core Gaming, Eyecon, Scientific Gaming, Red Tiger, Realistic Gaming, Foxium, Lightening Box and more! 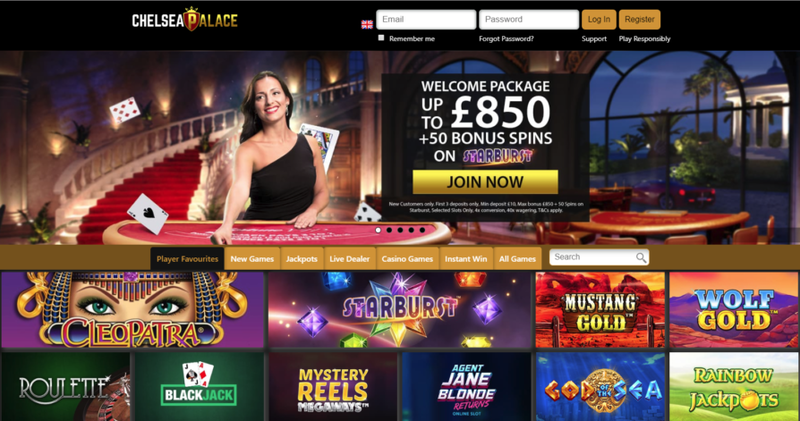 There are a range of bonuses that are available for customers to take advantage of at Chelsea Palace casino. Most of them are not new to experienced Nektan customers as they apply for a range of different casinos. What is different is the welcome bonus, which is up there with one of the most rewarding welcome packages that Nektan can offer. At Chelsea Palace, players can claim up to £850 as a cash bonus, as well as 50 bonus spins to use on Starburst. This is a great way to kickstart your betting account off, giving you sufficient funds to experience a range of games. As well as that, you can play one of the most popular casino games, Starburst, and use up 50 free spins, a great way of experiencing the greatness. After you have taken advantage of the welcome promotions, you can then take a look at some of the other offers that are available, which includes: Happy Hour Free Spins, Hump Day Free Spins, Tuesday Cash Prizes, Weekend Bonanza. There are offers almost everyday for customers to try out. There are over 600 games for customers to experience at Chelsea Palace casino. This is a great selection of games to choose from to allow you to have an entertaining time gaming. There are different genres of games for players to experience, as well as a great selection of Video slots, there are also table games, live dealer games, live casino games, jackpot games and more! Nektan casinos come with their own Nektan Games for players to experience and enjoy too. There are a range of different customer support methods for players to use in order to get in touch with a member of the Chelsea Palace Casino team. In order to find these methods, customers can click on one of the support tabs, which are located at the bottom of the casino and also the top, underneath the log in options. When you click on one of these tabs, a box will appear on the screen with all the applicable contact details. Players can contact a member of team via Live Chat, Email and also Telephone support. Live Chat support will put you in a 1 to 1 chatroom with a member of team. The telephone support line is open 7 days a week between the hours of 8am to midnight. Email support is open 24 hours a day, however it can take up to 24 hours to get a reply. There are always a range of payment methods for customers to use when it comes to Nektan casinos. It is a department of their casino in which they are good at catering for. Customers like to see a nice variety of payment options as not every punter is going to use a credit or debit card. The available payment options include: Visa, Visa Electron, PayPal, Skrill, Neteller, Paysafecard, Boku, Trustly, Zimpler. In terms of Nektan casinos, this is one of their best in terms of promotions. It is difficult to find a welcome bonus as lucrative as this one in the whole industry. As well as some great promotions for players to take advantage of, there is also a great selection of games to spend the bonus funds on. Players are in for a treat with this casino. It is a mobile friendly casino, allowing players to access it from the comfort of their own home. It is a great casino for new customers to sign up to and also experienced casino players, with a lot to offer both parties.